2. For the salad, in a medium, heavy skillet set over medium heat 2 tablespoons olive oil until hot. Add corn and cook, stirring occasionally, until lightly browned, 5 to 6 minutes. Stir in 1/2 teaspoon salt and pepper, and cook 1 minute more. Remove from heat and cool 5 minutes or longer. 3. Toss the diced avocado in a small bowl with 2 teaspoons of lime juice. Add it along with sautéed corn, tomatoes, and green onions to a large salad bowl. Toss mixture with half of the dressing and let stand 10 minutes. 4. Add the cilantro, mixed greens, and half of the grated egg to the bowl and toss with just enough of the remaining dressing to coat lightly. Season the salad with more salt and pepper to taste. Sprinkle remaining grated egg over the salad and if desired garnish with some cheese. Serves 4 as a main course or 6 as a side. Cooking tip: Instead of chopping a hard-boiled egg, carefully grate the egg using the large holes on a stand grater. This technique will yield a more even mix. 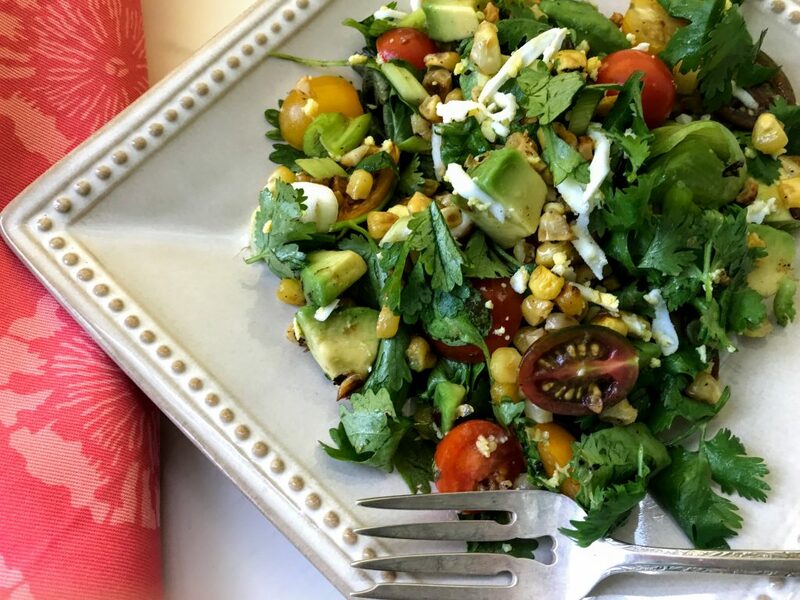 This entry was posted in Food News and tagged avocado, corn, salad, summer, tomato by brosbottom. Bookmark the permalink. You have no idea how much I look forward to your recipes arriving in my inbox. They are always utterly reliable and always delicious. I will try this recipe soon and thank you, thank you! Made the salad last night and loved it. The cilantro and corn were such a good addition. Thanks for your wonderful recipes. Going to the Basque Country in October then onto Paris and will be trying some of your restaurant recommendations in Paris.